I can't believe I did it, and on my own, too. 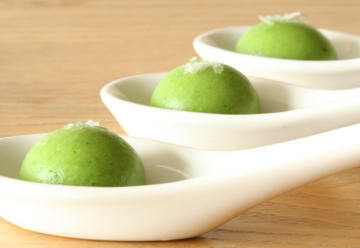 In a career chock full of signature creations, there may be no dish more identified with Ferran Adria and El Bulli than liquid pea ravioli, and no molecular gastronomy preparation generates more amazement and discussion. It is kitchen alchemy, really, and it captivates me. Liquid ravioli derive their name and their mystery from the fact that the entire raviolo is, well, the filling, and a liquid filling at that. The ravioli I made, for example, are made from nothing but peas, mint, water, and two very special ingredients. There's no pasta, no shell of any kind; it's just filling. I still remember the first time I saw liquid ravioli (cue the dreamy music). I was watching a documentary about Adria hosted by Anthony Bourdain, Decoding Ferran Adria. There is a moment in El Bulli's workshop early in the show where, after much debate, the production crew is allowed to tape the kitchen team making mango liquid ravioli, though no ingredients or technique are revealed. Subsequently, two people are shown preparing pea liquid ravioli. The viewer sees one person take a spoonful of pea soup, drop it gently into what appears to be nothing more than water, and have it turn instantly, magically, into a yolk-shaped raviolo (to view the clip, click the image of the pea ravioli here). Serve on a Chinese soup spoon sprinkled with a little sea salt, and, voila, the pure taste of pea in a way never imagined. Jaw dropping! From the moment I saw it, I didn't just want to taste it, I wanted to make it. Actually, that's not entirely true. More than anything, I wanted to know how to make it. Therein lies the problem, because this recipe seemed to be the most closely guarded secret in gastronomy, unless you include how they get the caramel inside the Caramilk bar. ... calcium chloride and sodium alginate. Once I knew that, all it took was a Google search to reveal all. Sodium alginate, which is derived from seaweed, is a common emulsifier and thickener in the food industry. If you've ever wondered how a McDonald's apple pie maintains its jam-like consistency, wonder no more. When sodium alginate meets calcium chloride, the sodium ions in the alginate are replaced by calcium ions, thus creating a polymer skin that holds everything inside (read more here). The first obstacle is knowledge, but the second obstacle is almost as challenging: finding food grade sodium alginate and calcium chloride. There are many, many companies in China willing to sell a couple of tonnes of either, but it was damn near impossible to find companies that would sell in quantities suitable for the home cook. The best thing to come of all this was finding an online supplier who will soon be selling both ingredients, especially since this company already sells virtually all the molecular gastronomy ingredients I need . As soon as I receive word that both ingredients are available, I will post a link to the supplier. The supplier, L'Epicerie, now has calcium chloride and sodium alginate for sale. Check out this post for details. Sodium alginate and calcium chloride in hand, I decided to experiment with instant coffee before taking the big green plunge. Aside from the fact that there are few things more vile than instant coffee, the experiment was a success -- I ended up with slightly misshapen ravioli that tasted exactly like the loathsome instant coffee with which I made them. It was time to make pea ravioli. My first decision was what to put in the pea mixture. I found a recipe for pea soup in El Bulli: 1998-2002, and decided that was my best bet. El Bulli's pea soup is made from only three ingredients -- peas, mint, and water -- so my mixture was too. After a little fussing and a lot of worry, it was time for the big test. I scooped up a little of the now pea and sodium alginate mixture, and slowly tilted it into the calcium chloride and water bath. The shape was ugly, but it gelled properly. I had ravioli. After a little fussing, I even managed to get the shape right too. The ravioli were excellent -- they taste like peas -- though I'd like to play with the recipe to see if I could intensify the flavours, perhaps by using less water. I still have a lot of learning to do. The problem with the mixture is that the ravioli must be eaten as soon as possible, because the reaction between the calcium chloride and sodium alginate does not stop. This means that, left alone, the ravioli will in fact turn into solid balls. My Spanish is poor, but I believe this site says the El Bulli team solved this problem by reversing the use of the critical ingredients: putting the calcium chloride in the food mixture instead, and then immersing it in a sodium alginate bath. I've also learned through my research that this does not work with highly acidic bases like orange juice, unless something is added to neutralize the acidity. Who knew studying chemistry could be so fun? 1. In a 23 cm x 23 cm x 5 cm (9 x 9 x 2) baking dish, combine water and calcium chloride. Whisk until calcium chloride is dissolved, then store in the fridge. 2. Meanwhile, cook frozen peas in a small amount of water for four minutes, adding mint leaves for the last five seconds of cooking. Drain, then shock immediately in a cold water bath for three minutes. 3. Combine water and sodium alginate, and blend with an immersion blender until the sodium alginate has dissolved into the water. The water will thicken considerably. Bring to a boil over high heat, stirring constantly. Remove from heat and allow to cool to room temperature. When cooled, blend with pea mixture using an immersion blender until the mixture is smooth. 4. Remove chilled calcium chloride mixture from fridge. Scoop pea mixture into a tablespoon measure in the shape of a half-sphere. Set the bottom of the tablespoon measure against the surface of the calcium chloride mixture, then pour the mixture in with a gentle turn of the wrist (to view a video of this being done, click the image of the pea ravioli here). Leave ravioli in the calcium chloride mixture for two minutes. 5. Gently remove the ravioli from the calcium chloride bath using fingers or a slotted spoon. Place in another 23 cm x 23 cm x 5 cm (9 x 9 x 2) baking dish filled with cold water or rinse gently under running water. 6. Top with a couple of grains of sea salt and serve immediately. You just never fail to impress me. I, too, fell totally in thrall with the pea soup ravioli the first time I saw Decoding Ferran Adria. Brilliant job, mate .. I do not know what else to say except ... We are not worthy! We are not worthy!!! Holy ravioli! That's friggin' AMAZING! I've never even heard of "liquid ravioli" nor could I have even imagined how cool and beautiful it could be. I, most certainly, am not worthy. You're also such a great inspiration to start using my scientific skills for good (food) instead of evil...I think the biggest obstacle would be to get over using the chemicals, since I only get to see them on the shelves in my lab...it's the little skull and crossbones on the side that bothers me ;) Just kidding. These look incredible, Rob. Bravo! Wow Rob, this is amazing. I tell you, you must have been a chemist in a previous life! I make a similar pea soup and now I am tempted to push the boundaries of my cooking!! You are amazing! I want to taste them now! hi rob, this really is beyond beyond - i am staring at your perfect magical pea blobs in slack-jawed disbelief and awe right now (i well remember that episode of decoding adria and the pea ravioli). also, i must have been living under a rock all this time - thanks for giving me the opportunity to discover your fabulous site! prof rob! liquid ravioli..i'd love to visit his restaurant one day - or yours? You didnt! My jaw has dropped to the floor. I am utterly impressed at your culinary ambitions, I can only imagine that your kitchen is at times like the lab of a mad scientist! When I saw that program on El Bulli, I think I was most struck by watching them make these raviolis. My hats off to you for not only attempting it, but by the looks of that picture, for doing a damn fine job of it. I am curious to see what future ravioli flavours you may decide to invent! Bea and Rob... green dreaming ?? I love your liquid ravioli, Rob!! Rob, you never cease to amaze me! These look unbelievable: the colour, the shape, and the texture are simply astonishing. Bravo!! and to think I was doing well by duplicating a jaffa cake. absolutely brilliant! your post is wonderful. I applaude you for your curiosity, determination and obvious talent. Thanks for the praise, MM, but I'm not worthy. Michelle, I know chemistry isn't your discipline, but you should give this a whirl if you can get your hands on the chemicals. It's actually not that hard. Bea, I've admired the picture of the pea pod you submitted for Foodography. Now I think you should take those peas and try this. McAuliflower, I think you and I share some common culinary goals. Just to clarify, it takes many, many hours for the ravioli to completely solidify. These can easily sit for at least fifteen minutes (I know from experience), and probably much longer before the gelling becomes a real problem. Francesca, grazie per aver visitato il nostro blog e per i complimenti. Ho una copia di "La scienza in cucina e l'arte di mangiar bene," da Artusi. Stasera, mi sono reso conto che c'e' un scienza culinaria che Artusi non avrebbe mai potuto immaginare. J, thank you, and the feeling is very mutual. Cin, I too would love nothing more than to dine at El Bulli one day. As for a restaurant of my own... I think I prefer cooking for myself, my wife, and my friends, and then getting to write about it and share it with people who share this same passion. Thank you, Sandra. Green really is a wonderful colour, isn't it? There's something about its vibrancy that just strikes a chord, especially with spring starting to bloom around us. Sam, what's a jaffa cake, or do I have to wait for St. George's Day? Sam, thanks for the compliments. Working hard is a lot easier when it's fun (and this really is), and when people like you tell me how much you enjoy the fruits of that labour. TBTAM, so far, so good. If things go horribly wrong, can you refer me to the best gastroenterologist in Manhattan? Fabulous! I love how the ravioli are so perfectly spherical (They look huge, too). Chemistry as never my favorite subject - if only they'd taught it this way in school,I might have felt differently! Unbe-frickin-lievable. Truly insipring. You mentioned about trying this with citrus if you could figure out a way to neutralize the acid. What about crushed-up Rolaids, or something like that? It sounds wierd, but this whole thing is wierd. Ciao. I know you're speaking tongue in cheek, Peter, but the thought has seriously crossed my mind. Anita, I actually wish the ravioli weren't so spherical. In the Adria video, they're shaped more like the yolks in a fried egg. I don't know whether the difference in shape is due to the tablespoon measure I used to ladle the mixture or to the consistency of the mixture itself. Melissa, you're very welcome. Culinary sleuthing is a lot more fun than, well, most things, actually. Thanks, Ian. Crushed up Rolaids may very well do the trick, but I'm sure there's a substance out there that's a little easier to work with. jasmine, thank you very much. I devoured this post. You are my new hero! Excellent read and "lecon de cuisine". My brain was challenged, my tastebuds were tickled and now I want to go out and play! and yep, I'm still lost for words!! to neutralize the acid you need a base and the commonest food base is baking soda (sodium bi carbonate) which will fizz when added to an acid like (say) orange juice and will convert acid to water and various salts. The problem is that it isn't likely to taste good. I wonder just how much acid you can get away with? The rolaids suggestion is basically the same one but with a lot of other things that will muck up the taste. Rolaids are basically chalk - calcium carbonate - a milder form of the same thing as baking soda for your purposes. Milk products also help bind acids up but again - not the taste you want. So I guess I'd tinker with amounts and proportions of baking soda to see just how little you can get away with. (and it will be just a little - a teaspoon in a cup of OJ is probably too much). I am like Bron - I keep coming back. Check at any online or brick & mortar homebrew or cheesemaking shop for calcium chloride.